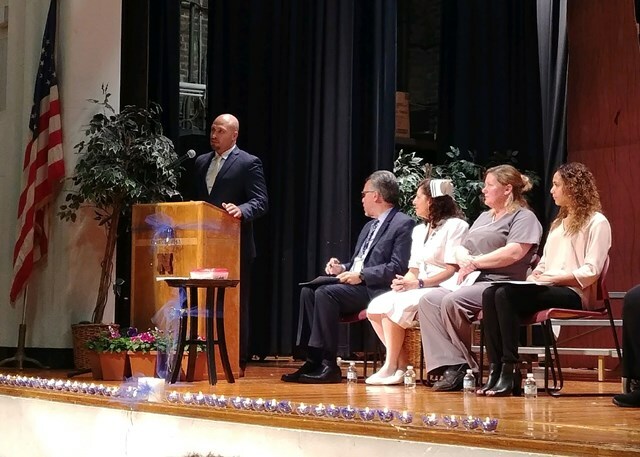 Recently, Newburgh Free Academy North Campus seniors celebrated the culmination of their internship held at Elant at Meadow Hill as part of the Newburgh Enlarged City School District’s Nurse Aide Training Program. Once completed, the pathway offers students the opportunity to pursue careers in long-term care facilities, home health agencies, and hospitals where basic bedside care is needed. Curriculum is mandated by the New York State Department of Health and includes the required clinical hours in a nursing facility. Students graduate with a New York State Nurse Aide Certification. "The pinning ceremony is a time-honored tradition. This signifies your official initiation into the brotherhood and sisterhood of healthcare professionals. I am so very proud of each student. Their hearts are dedicated to caring for others,” shared NFA Nurse Teacher Linda Romano.